Crankshaft vibration damper remover – Jaguar No.303-D121. Crankshaft vibration damper installer – Jaguar No.303-102. Engine at TDC on No.1 cylinder with marked links and timing marks aligned  ,  ,  ,  &  . Remove RH tensioner  , RH tensioner blade and RH chain guide  &  and RH chain. 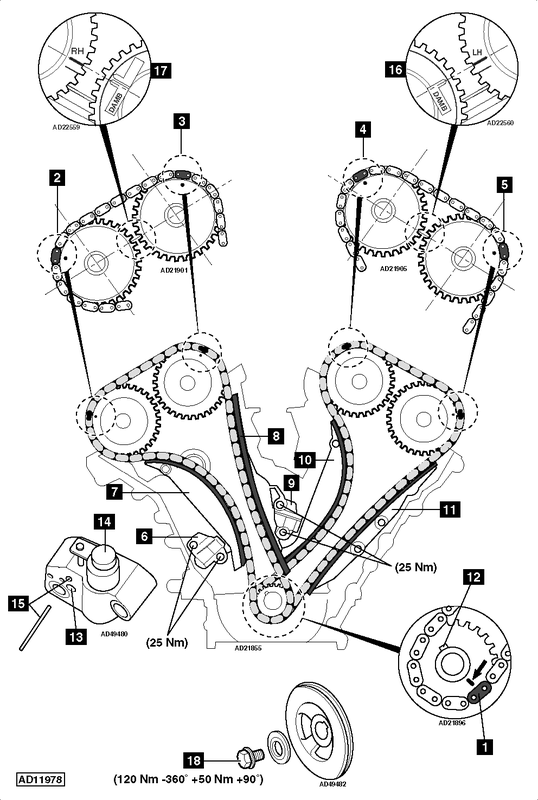 Remove LH tensioner  , LH tensioner blade and LH chain guide  &  and LH chain. Ensure timing marks of both LH camshaft sprockets aligned  . Install LH chain guide  . Install LH chain ensuring marked links aligned  ,  &  . Install LH tensioner blade  . Ensure timing marks of both RH camshaft sprockets aligned  . Install RH chain guide  . Install RH chain ensuring marked links aligned  ,  &  . Install RH tensioner blade  . Seal crankshaft pulley keyway with a proprietary sealant. Tighten crankshaft pulley bolt to 120 Nm slacken 360°. Tighten to 50 Nm + 90°  .